Home Are you looking to sell your home? With slightly tougher conditions ahead Gary Warby, Managing Director Premier Windows, highlights ten home improvements to help you sell your home. Recent reports show that while far from having a catastrophic impact on the housing market, house sales have taken a down turn while buyers wait for the Brexit situation to settle down. This is certainly not a bad thing – house price affordability remains a big issue for the UK – but for anyone who needs to move, it makes things just a little bit harder. Home maintenance plays a big part in your properties value. While a handful of buyers may find a ‘doer-upper’ appealing, the majority will be put off by peeling paint work, rotting timber windows or doors with poor secuirty. And even if you do find a buyer who’s prepared to take on the work, they’re going to want to push you down on price to cover the cost. Maintaining your home, by contrasts, maximizes the appeal of your property and helps you stave off potential price negotiations at the point of sale. A warm home is always appealing. Rising energy prices and the cost of heating means that prospective buyers are more switched on to home energy efficiency than ever. Central heating and an efficient, regularly serviced boiler are important to anyone buying a home and more so going into autumn. The same rules apply here. If they accept that they’re going to have to pay to heat it, prospective buyers will want to maximize their return on those costs by trying to keep the heat inside the house. Old windows can be loose 25 per cent of heat from your house. PVC energy efficient double glazed windows and doors can cut this heat loss by up to 75 per cent. Big or small, people like outdoor space. Make sure that it’s also looking its best. Even small spaces can look lovely with a few pots and a little bit of TLC. People want to feel warm and safe in their home. Rotting timber windows or old PVC-U or aluminium windows and doors can be easily forced. New multi-point locking windows and doors, will give prospective buyers a sense that their new home is also ‘a castle’. This always helps sell a home. This is something you’re either going to have or aren’t but if you do, make sure they look appealing. First impression really do count. Poorly maintained, windows, doors gardens and driveways can create a negative first impression to a potential buyer. If your house is painted make sure that you give it a refresh. If windows are old, or worse an unsympathetic design, consider they’re replacement. The cost of doing so may be considerably less than you think and with a wide range of colour choices and finishes, you can pick the perfect design to give your property a wow factor. Creating a space the size of a double bedroom can add around 11% to the value of your property. Energy efficient glazed extensions and conservatories are a very effective way to do so. Add a new living-room, dining room, or kitched to your property for a fraction of the cost of a traditional ‘bricks-and-mortar’ extension. If you’re selling a two-bedroom property or more, a second loo can be a deal-clincher! If you don’t have one, consider installation of under-stair and compact solutions or if you do decide to extend, build it into your design. Modern family life is just too busy to be queueing cross-legged outside a single bathroom! Even if you don’t have time to take long relaxing baths, don’t be tempted to rip out your bath tub. Buyers like the option to take a bath, even if they then decide to rip it out. A little investment in your property can change the way you think about it. Unless you have to, you may find that adding a little more space or new energy efficient doors and windows, a lick of paint and a tidy-up of the garden means you decide to stay after all! 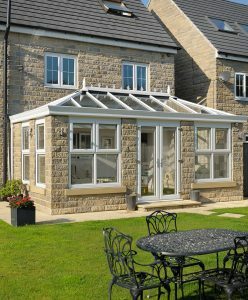 Premier offers an extensive range of home improvement products including energy efficient and low maintenance, double and triple glazed windows. We offer a wide choice of high security front and back doors, including police approved Secured by Design Specifications. We can also help you to extend your home at a fraction of the cost of a traditional build. Call 0800 854 353 or email enquiries@premwindowsanddoors.co.uk to find out more.